#830 FL Motivated seller will accept a reasonable offer! Possible trade considered! 2005 M-450 LXI Triple slide-out. 105K miles on this original owner coach. 525HP Cat C13. Three stage Jacob engine brake and Allison MH 4000 6-speed transmission. Six channel ABS air brakes with traction control. 20KW generator with auto start has 1600 hours. This coach is in top condition. Always well maintained and serviced. Owner has maintenance records and Blue Bird box with manuals and schematics. Engine and generator just serviced. Coach has many upgrades including new TV's, multimedia/navigation center, new wood flooring, new marble floor, new radiator, new batteries and new tires. EXTERIOR Colors are black over white base with accents of gray and gold pinstripes along with stainless steel package. Paint has double clear coat. INTERIOR has special ordered cherry cabinetry. Wood floor in salon and carpet in bedroom with diagonal laid marble floor in galley and bath. Solid surface entrance steps with brass grab handles, center aisle floor plan has down spotter lighting throughout. Six way power extra wide pilot seat and co-pilot seat are covered in ultra villa leather. Co-pilot seat has power foot rest. CB radio and built in radar detector. AM/FM/CD/GPS with satellite radio optional. Power shades for windshield and pilot window. LIVING ROOM has double slide outs, new LG 44" TV, ultra leather sleeper sofa, Corian topped end table with built in wine cabinet, built in desk, coordinated window treatments, and day night shades throughout. KITCHEN has cherry cabinetry, Corian countertop with granite style edging, double bowl molded Corian sinks, tile backsplash, beveled mirror strips, Grohe faucet (facet water filtration at kitchen sink), instant hot, 120v two burner cook top, stainless steel micro-convection oven, stainless steel Kitchen Aid house hold side by side refrigerator with ice and water (powered by third inverter), two pull out pantries, Kool-O-Matic fan with rain sensor, and new marble floor. Dinette booth has ultra leather cushions with electric slide Corian table, and wall with beveled mirror strips. WALK THROUGH BATH features cultured marble vanity, private toilet with lavatory and window, cultured marble round shower with tile inlay, stacked washer and dryer, vent over shower, wardrobe, and marble floor. BEDROOM has slide-out with cross island King bed, Corian topped night stands, new 32" Vizio TV, AM/FM/CD/DVD entertainment system, day-night shades, carpeting, special ordered electric heat, and security control switch in bedroom. OTHER FEATURES include: King Dome Satellite system, two 3.6KW Vanner inverters with 60 amp 24v chargers (powers #1 and #4 AC units), 0ne 1500 watt vanner inverter, eight 4D AGM batteries, Zip Dee awning package with two Girard electric powered patio awnings, air leveling system, 80,000 BTU diesel fired Hydronic heating system, four A/C units with heat strips, Blue Bird lawn chairs, back up camera with selectable color or black and white monitor, built in burglar alarm system, door chime, auxiliary air compressor, main bay double sided 'Joey' bed, Sanicon waste system, and chrome dual heated remote rear view mirrors. 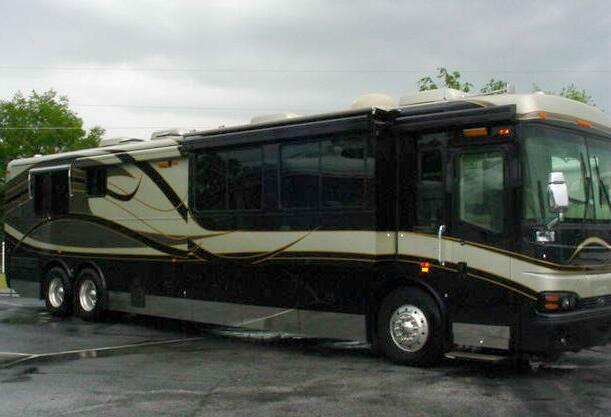 This beautiful, non-smoker, one owner coach is garaged. Coach is loaded with special options and is in excellent condition. Priced at $179.9K. Call 217-826-8907 for details.